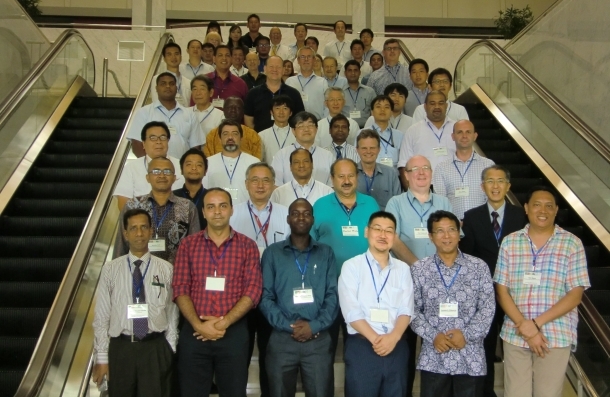 The Reference Frames in Practice (RFIP) series has been in operation since May 2012 and this year’s seminar was convened in Kobe (Japan) on 29-30 July 2017. The seminar venue was the Kobe Chamber of Commerce - Port Island, and was hosted by GSI - Geospatial Information Authority of Japan. A special thanks to Mr. Basara Miyahara and his team at GSI for their great hospitality. The seminar was organised by GSI, IAG (International Association of Geodesy), FIG (International Federation of Surveyors), UN Global Geospatial Information Management for Asia and the Pacific (UN-GGIM-AP), ICG (International Committee on GNSS) and JFS (Japan Federation of Surveyors). The financial sponsors of this event were RIPRO, Nikon-Trimble, Leica Geosystems, and PASCO. Acknowledgement and appreciation to the ICG as they provided financial travel assistance to four delegates from Bangladesh, Fiji, Philippines and Tonga to attend this seminar. Like previous seminars this RFIP was well attended. It attracted 68 delegates from 19 different countries. From a program perspective, there were 21 quality presentations which included 4 presentations from the event sponsors who provided a manufacturers perspective on the issues and challenges relating to geodetic reference frames. The seminar’s objective was to provide fundamental geodetic reference frame background, concepts and examine the associated data and analysis techniques, each with a focus on practical implementation and application.